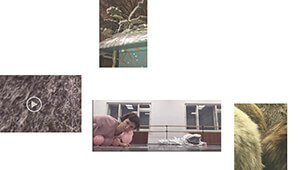 Ljubljana-based intermedia artist Robertina Šebjanič might be one of the most interdisciplinary artists of our times. She is co-founder and active member of Theremidi Orchestra, an audiovisual DIY noise and drone working group, and she participates in the platform of open source biological art projects, Hackteria Network. 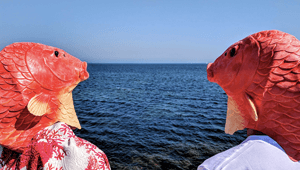 Robertina often collaborates with other artists to develop her artistic research and she has performed and exhibited internationally at countless galleries and festivals. Robertina’s work encompasses audiovisual installations and noise/sound performances that tackle philosophical questions of our modern society unfolding her passion for understanding living systems and how they interact with the environment. With a background on traditional media like video and sculpture, sound and electronics quickly became powerful means in her research of the surroundings. This is substantially noticeable in one of her finest works, Aurelia 1+Hz / proto viva sonification, for which she got the Honorary Mention at the Prix Ars Electronica 2016. 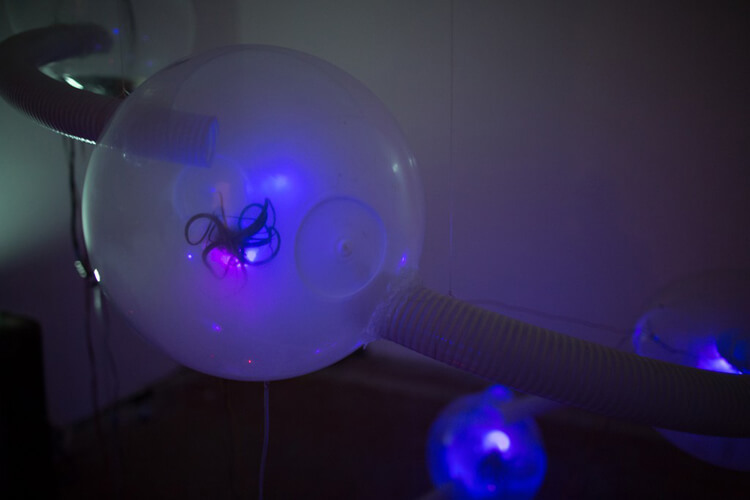 In this interactive performance, Robertina uses bioacoustics to explore the possible systems of interspecies communication, in this case the species of Aurelia Aurita or moon jellyfish. The result is an immersive sound experience that reflects on the cohabitation with other species and how humans impact on their lives. A previous project, Humalga: Towards the Human Spore, is a controversial proposal for the creation of a transspecies, a hybrid between human and alga, that would allow our survival as species in the emerging sociocultural environment. 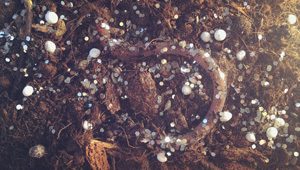 In her most recent work, Time Displacement/Chemobrionic Garden, Robertina turns to sound as the main element of the performance to investigate the connection between the origin of live and the passage of time through geological chemistry reactions. Robertina’s explorations on the philosophy of social science fit ingeniously in our modern societies and nurture the ethical awareness and accessibility of science. To such an extent that she makes us believe that a more utopian future is possible if we understand better our relationship as human beings with nature. 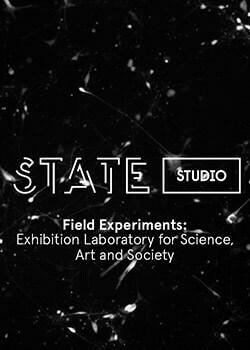 What drew you to working at the intersection of science/living systems, technology and art? I have always been interested in understanding the function of the systems that are surrounding us. When I talk about the systems I mean the (bio)political systems and how our society is functioning; however, I am also trying to understand the biological systems = living systems. Those two are mirroring each other. During my studies, I worked in video and sculptural / ambiental media and techniques. Soon after finishing studies I started to get involved more and more deeply with electronics, simple robotic and living systems, and through these practices also with bio and tech hacking communities. I later worked at the institutions such as Ljudmila, and I’m also a member of informal networks Hackteria. My work has always been inspired by philosophy, scientific achievements and science fiction. So I started to work more at the intersection of art, technology and science. It was simply the best possible platform through which I could present my interdisciplinary practice. I do try to “step back” from the Anthropocene fixation on the human, to come closer to the understanding of the role of cohabitation with other living organisms – that is the awareness which is more and more present. That is the reason that my works deal with diverse mirroring situations in our societies. Lately I am more focused on water habitats and their life; however, my projects range between rethinking future speculations of new trans-species (Humalga), animal-machine-human relationships and inter-species communication (Aurelia 1+Hz), and pointing out underwater noise pollution and its potential ecological consequences/challenges (Aquatocene / subaquatic quest for serenity). Sound is an important element in your work. Aurelia 1+Hz / proto viva sonification aims are to explore the phenomena of interspecies communication, sonification of the environment and the underwater acoustic/bioacoustics. Could you tell us a little bit about the intellectual process behind? Sound plays an important part in the realisation of the project Aurelia 1+Hz / proto viva sonification. The sound gives me a great possibility to express the context of the project with poetic & scientific means, and it works great for the audience. One of the challenges of the project was to bring “an unknown” species – jellyfish very close the public, in a way that would feel natural but still maintain firm artistic and scientific interpretation; it is surely not about the spectacle of displaying an animal in the aquarium in the gallery setting. The main question that I have been raising is: what is the new reality of nature – culture // human – animal? I sometimes use a quote of the poet Paul Celan to explaining the project: “There are still songs to sing beyond mankind”. The core idea of the project is that there is not only human culture but also other species (animals, plants, fungi, bacteria, etc.) with complex and highly developed languages/communication systems. 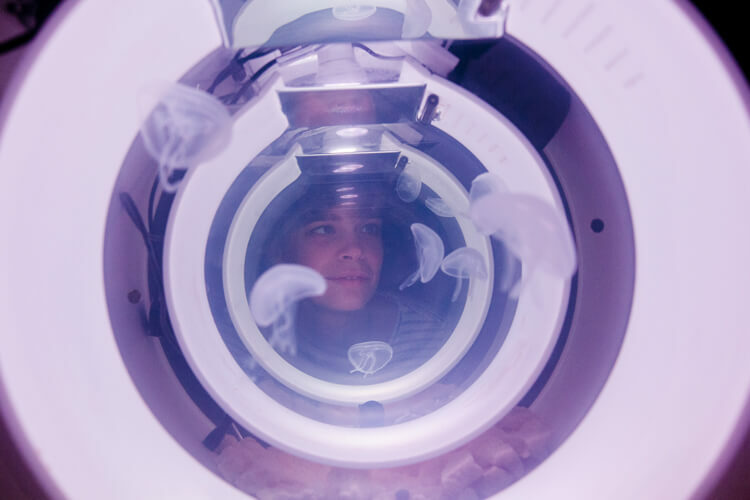 In the past five years, I have worked to understand the relationship between the marine organism – jellyfish, its environment and the impact of our research to the knowledge about and relationship with the animal. 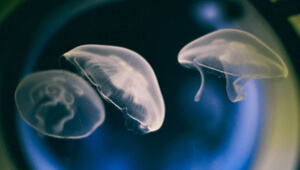 The sound that is used in AV performance partly comes from the sea (recordings of the jellyfish blooms) and partly from the experiments in the laboratory (recordings of sonification of their movements). Most of the sound recordings were done during my residency at the Izmir marine station with sonic, seismic devices and hydrophones. There are different categories of sounds that are then performed in the AV performance. The technical part of the system was developed by my collaborator Slavko Glamočanin. 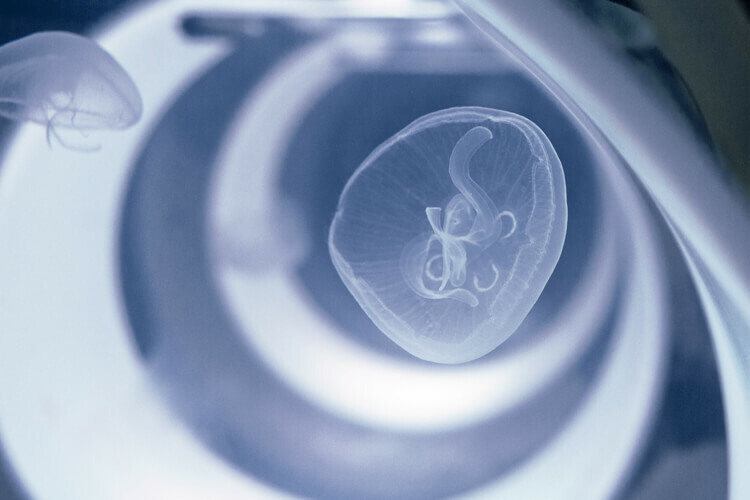 I have worked in laboratories and also on the field recordings of the jellyfish species Aurelia Aurita which is the most common species present in the world’s oceans and seas. As it is a model organism in biology, a lot of research already has already been done on them; it is widely known that they communicate with each other on the polyp stage with the chemical components; however, it is still unknown if they also communicate with sound. Some interesting facts – until something new is learned: It is known that Aurelia Aurita has rudimentary sensory nerves at the base of its tentacles which allows it to perceive light, smell and orientation. Its gravity receptors (calcium crystals) are similar to humans’ inner ear (Vestibular system). Jellyfish is one of the ancient species that has been around for more the 500 million years. Even though the environment of the oceans and seas is lately rapidly changing, mainly because of the human imprint, it seems that it does not disturb them. They can adapt to more acidic, less oxygen environment and survive, unlike the numbers of other species such as corals, fish (mostly because of overfishing) which are rapidly shrinking. 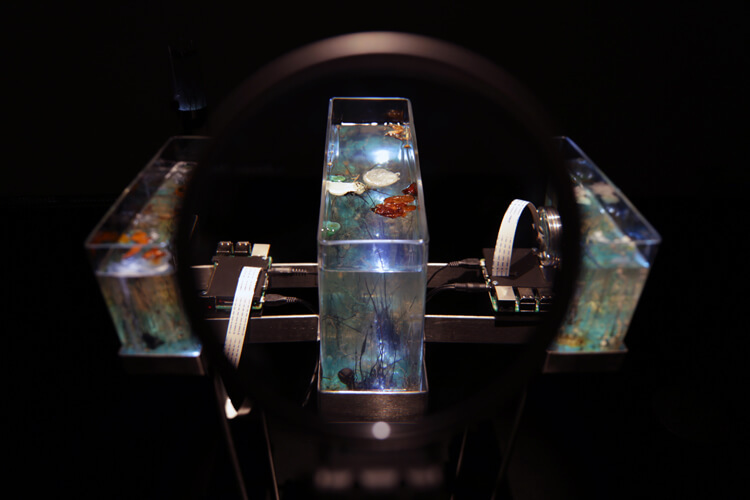 Time Displacement/Chemobrionic Garden is an interactive generative chemical sound installation. What were the biggest challenges you faced for its development? 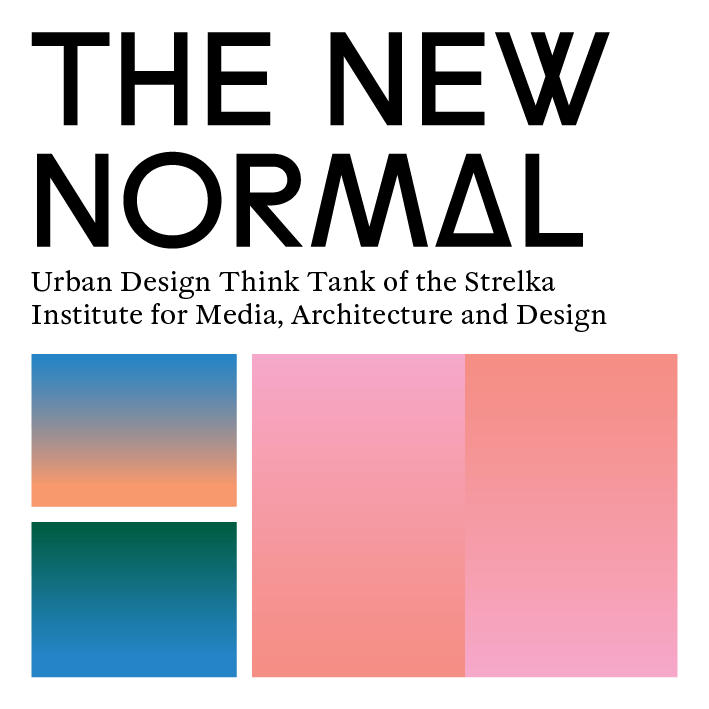 The core idea of the project that was developed in collaboration with my colleagues Ida Hiršenfelder and Aleš Hieng – Zergon was to try to interpret the different time scales. We have been trying to find the best way of how to interpret the difference between geological and biological time scale. We sought to find the best way of how to show it. We had been figuring out that would be true the sound best. It was as challenging, but it is great when the viewers get the time scale communicated through experience the sound installation. The technological development was smooth once the core idea of understanding these two different time scales was crystallised. We decided to have a tracking system which was done by growing the crystals in the “main conductor” of the speed and change of the sound in the gallery. 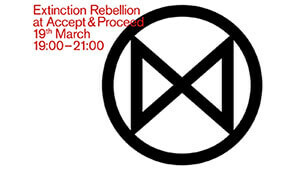 The basic concept is the study of chemobrionics, a field combining chemistry, physics, biology, and material science, which we tried to expand in the space; we merged this idea with the ground floor plan of the gallery to bring into the exhibition space also the presence of alchemy. Oscillatorium-Living Systems Oscillation theorises about the possibility of developing technologies that are nature-centric rather than human-centric (Anthropocentric) and Humalga: Towards the Human Spore proposes an alternative evolution of the human species. According to a paper in Science (January 2016), ‘we are in the midst of the so-called sixth great extinction, the Anthropocene or the age of the humans’. How do you imagine the future of the human species? The core of the project Oscillatorium-Living Systems Oscillation I developed together with Monika Pocrnjić, was to test and rethink the theories of the oscillation, as this is one of the basic fuel that is moving most of the biological processes and to make a simple concept to developed more nonhuman used technologies. One of the first ongoing researches and projects that I worked on in the field of biological and human life and its possible development of the new trans-species that would be able to potentially to adapt for space travel/living on other planets was Humalga. 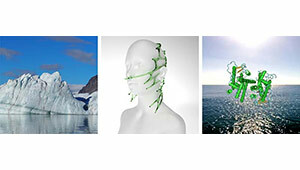 The conceptual core of the project (in collaboration with Špela Petrič) was to propose an alternative and to construct evolution of humankind where a biotechnologically engineered post-technological vehicle, that leads to the creation of new species a “hybrid” between humans and algae, also announces changes in the human societies. Yes, I know it sounds super ambitious. But this kind of “storytelling” has been productive. Many different aspects challenged both us and the audience to rethink their knowledge and beliefs. From the role of women beyond being the reproductive element to food production that will surely change in the future, if I mention some of them. The project had its visual presentation and also proof of the concept was done in laboratories in the National Institute of Biology in Bangalore during the Hackteria Lab event. Mostly was project presented at symposia/discussions events, that we organised together with my colleague Špela Petrič. We invited different experts to give talks and take part in discussions with the public. We are now working on concluding the project and on the publication of a catalogue. If I answer in the spirit of the project, I would have to say that we (=humans) should step down from our pedestal and rather try to understand all living systems, together with their complexity or/and simplicity. There are many species on the brink of being extinct, and yes, it is true, that was also happening before. Also, the name, the sixth great extinction, refers to that – but the human presence on earth accelerates these changes; however, it is possible to learn from the past when the earth was eventually resettled with new life forms and species after each extinction. We have to open up to the knowledge. I would like to refer to the open access to the commodity of education. I have to admit that I do not feel super excited about human activities in future. If we continue with our habits in the same way as till now, then the situation will deteriorate to the point when a global predator =human will overtake all habitats. We are already looking into the future where people would also live on other planets. There are many types of research, experiments and adjustments to be done on this path, but we are approaching it. I have one remark regarding this path: I hope that humans will go to live on another planet, not only because we would need to have a backup plan, but also because this would be a possibility to extend our horizons. Fear is the main enemy of mine. I see it as one of the main tools which have been used to shape (bio)politics. What and from who is a bit different from geopolitical points where do we live in this world, but it is one of the strongest and scariest emotions that are paralyses creativity, imagination and opens the door to the eerie, frustrated and dark future. … Water, plants, sun, animals, moon, earth, bacteria, cosmos, humans, fungi.